Six of Swords says a difficult cycle is ending – allow it to phase out now – quietly pass through it by setting your sights on the future. Look at things the way they are – not the way you want them to be. Think with an open mind. Investigate all the possibilities. You are experiencing an unpleasant, frustrating situation – sever yourself from it and you will know peace of mind and harmony, like the sunshine after a storm. You are making great progress now. Recognize that everything is relative to one’s viewpoint and communicate in a non – threatening way that will allow other people to consider new ideas, thoughts, beliefs and attitudes from perspectives that they have not yet considered. You carry your troubles with you, have adapted to them and they no longer represent a heavy burden to you. Blessed with the gift of support in adversity – the ability to stick with someone when their luck has run out or help them through difficult times and transitions to new phases – you maintain a personal perspective and mental tranquillity during times of turmoil. You are willing to “cross the water” to see the other persons point of view and in resolving arguments you “lay all the swords on the table” in order to achieve clarity and unruffled communications. You now recognize that by staying calm, you waste neither energy nor opportunity. The emotions at work on the Mental Plane – duty and obligation make service a more attractive as well as necessary adjunct to the ego’s programs. With the expansive lessons of the 6’s, you mind begins to know that the boundaries of self do not stop at the surface of your skin and your goals begin to take on the air of the extended self. Helping others, with mental generosity, is seen as the way of helping self as your personal goals become more and more integrated with those of others. Even independent thought has an inclusive element of the immediate other – of the thoughts of those most important to you. The necessity of balancing give and take mentally is dealt with. Responsibility is accepted willingly as you become as reliable to others as you were to yourself at the level of the 4’s. Service as work/profession appears here. Here is the application of mind to longer, more complex tasks, many of which are worthwhile causes. Advancement and promotion of ideas is increasingly important as progress comes principally through mental effort. your heart is energizing and pushing your mind, supporting your projects. Motivation is high as mental goals are raised. Mental obligations and duties present themselves as laboratories for you to learn in. Protective mind in a positive sense. Consideration, mental recognition. When you step back from your problem to gain a clear perspective – what do you see? Any Ten before or after: Indicates an important decision regarding a move – a possible trip or new residence. Next to Moon or High Priestess: You do not have the full picture yet – wait before making any changes. Next to Wheel of Fortune: Do not take any unnecessary risks now – expect a change in your financial affairs. The benefits are coming in – you must be patient now. In the first position: The progress made in your Mental Plane will allow you to practice the lessons of mental generosity and inclusion. The people closest to you will be the primary beneficiaries. Where you go, so goes your entire extended family. In the second position: Whether by the content of what you say or by the magic of your voice, you are able to muster the resources you need when you need them. Because you have accepted responsibility for others and been there when they needed advise, physical/material help will be there should you need it. In the third position: At this time you must open to accept a greater range of responsibility for the administration of others’ affairs as well as your own. Your intellect is needed by those close to you. In the fourth position: A strong blend of mind and heart here can generate a passion that harnesses the talents of a communicative and dedicated mind to worthwhile causes. But also here is a love for what the group mind can achieve. Together these desires are the fuel that motivates great leaders. In the fifth position: You are aware that you have a greater scope now and if the canvas of your mind is not yet larger, you have already purchased more oils in expectation of doing a bigger painting. People may be knocking on your door, ideas demanding attention. In the sixth position: Mental expansion in new, larger areas with a larger cast of characters ripples through your personal life. There are changes in the value and hierarchy of opinion at home, at work or between home and work. 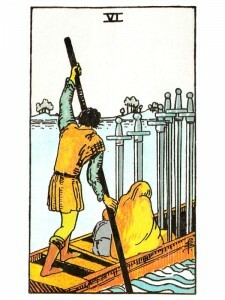 In the seventh position: Deal head on with hesitation to mix your thoughts with the thoughts of others. Your ideas will not only survive, but thrive. In the eighth position: Moving day, theoretically for your mind, but the mental expansion may have indeed necessitated a physical change. If not actually changing homes or offices, the physical “moving” may be in the furniture and equipment which facilitates your mental work. Rearrangement or integration of new gear, new technology are possible. In the ninth position: The heart has already committed to a much broader frame which the mind must react to. The extended family exerts enormous pull on you to join in. Your role awaits you. In the tenth position: Should you have missed opportunities and lessons, grace will provide them before this time next year.